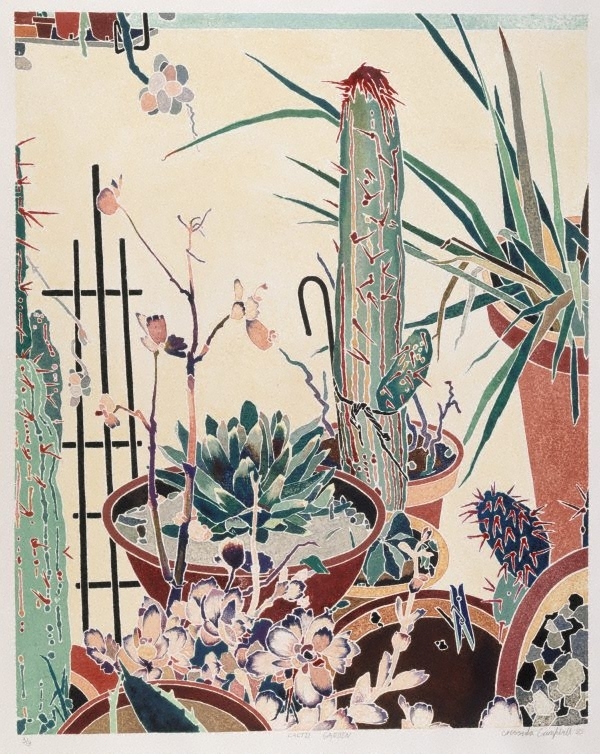 Cressida Campbell began making prints while a student at East Sydney Technical College in 1978-79. In 1985 she visited Japan, where she studied Japanese woodblock printing at the Yoshida Hanga Academy in Tokyo. She began making large colour woodblock prints like 'Cactii garden' that same year. Her method differs from the traditional Japanese method however, in that she does not use a different block for each colour, and applies watercolour with a small brush, rather than using ink scrubbed on the block with a hard brush and run through a press. Her early prints were made in small editions of up to ten, but more recently her work has usually been limited to one print. "I begin each woodblock by drawing straight onto the block from life, making notes of some of the colours, and then return to the studio where I carve the block and paint it. When two coats of paint have dried I spray the block with water and place a sheet of Fabriano paper over the image. Using a roller I apply pressure onto the back of the paper. Signed and dated l.r., pencil "Cressida Campbell '85".